The Bradshaw Mountains are located in just south of Prescott, Arizona. They have a long history of gold mining, and they are still an area where you can go out and search for gold. Located in Yavapai County, the range extends about 40 miles, and gold occurrences have been found throughout the range. Metal detecting is a popular method to search for gold nuggets in the Bradshaw’s. Most nuggets are found in narrow, dry washes the drain the high country. Bedrock is generally very shallow, and nuggets are found within a reasonable distance from the surface. Distribution can be very spotty in some areas. One of the best locations in the Bradshaw Mountains to prospect for gold is at Lynx Creek. There are several miles of the creek that have been withdrawn from mineral entry, meaning that the area is open for anyone to prospect. This is a place where you can use gold pans and sluice boxes to recover placer gold from the creek. The Big Bug placers were found in stream gravels and gravel-covered mesas in a roughly triangular area that extended for approximately 20 miles east and northeast from the headwaters of Big Bug Creek below the Mesa Mine. The majority of the placer-mining activities were concentrated in that portion of Big Bug Creek. Also, in the creek’s tributary gulches and gravel benches in the area bounded by McCabe, Humboldt and Mayer; such as, Eugene and Chaparral Gulches and other smaller and unnamed gulches. The Groom Creek district is mainly in the vicinity of upper reaches of Groom Creek, an intermittent stream that flows southwestward to join the Hassayampa at a point about five miles south of Prescott. Going five miles south from this area was the site of many mines like the Empire, King-Kelly-Monte Cristo, Victor and Home Run Mine, which have all produced rich lode gold deposits. In the headwaters of the Hassayampa River, placers were found along Groom Creek, the Hassayampa River, and small side gulches. The central part of the Hassayampa drainage area, near Walnut Grove and Wagoner, includes the Hassayampa River, tributaries on the west side (Placerita and French Gulches), tributaries on the east side (Blind Indian, Milk, Minnehaha, Cherry and Oak Creeks). The gravels in the river near Walnut Grove contain many boulders but no clay; the gold is described as generally fine and flaky gold. The Hassayampa River was most actively worked between 1885 and 1890. Gravels were mined along the upper parts and side gulches of Placerita Gulch, near the junction of Placerita and French Gulches, and on French Gulch, one mile southeast of Zonia. Much of the gold recovered in these gulches was fairly coarse. Placers have also been found in Blind Indian and Milk Creeks on the eastern side of the Hassayampa. Further research about historic gold mining in the Bradshaw Mountains will show that there has been considerable mining activity over the past 150 years. 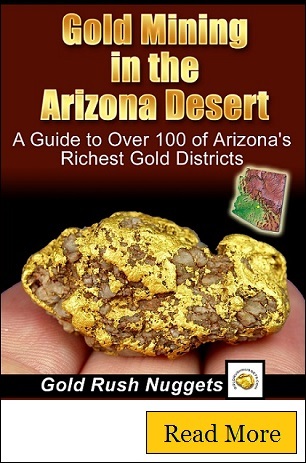 Many well established mines in this part of central Arizona have produced a lot of gold. However, the gold distribution in many parts of the Bradshaw Mountains is spotty. There are countless “nugget patches” where just a few gold nuggets might be located with a metal detector. There are undoubtedly many more nuggets that are still waiting to be found. Today, some of the best areas to prospect for gold in the Bradshaw’s are likely to be some distance away from the known gold placer mining areas. There are many prospectors in this part of Arizona, and many areas have been hunted hard over the years. Hiking and getting away from the roads might pay of will some nice gold. The Bradshaw Mountains are a beautiful place to prospect for gold. During the fall and winter, the weather is perfect to get out and search for gold nuggets with a metal detector.